San Antonio's massive Cornerstone Church, home to anti-gay crackpot John Hagee, is about to launch at attraction meant to demonstrate to children that Noah's Ark was real. 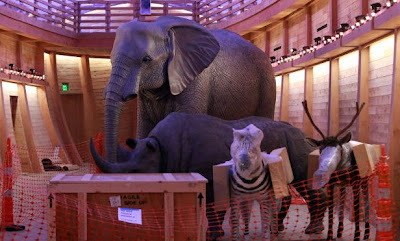 Meant for children, the new facility with true-to-size animatronics animals is to underscore the Bible's authenticity. With its unique, stimulating and larger-than-life elements, the Ark experience will truly bring to life the famed Bible story and be an inspirational adventure to all who enter," the 20,000-member church says on its website, of the building that cost nearly $5 million. "I want them to say it happened," Executive Pastor Matthew Hagee told mysanantonio.com. "The Ark was real. Salvation is real. What God desires for Noah, God desires for me. For Noah, it was a boat. And for me, it was Jesus Christ." Designed to handle about 850 children, the Ark's construction began in November 2011. The congregation gave cash donations to cover the cost. Criticized for the cost of the project, its director said that what they'd done was not unlike how casinos build grand palaces to "incentivize gamblers."